The New York Red Bulls have signed Marcus Epps to an MLS contract, the club announced today. 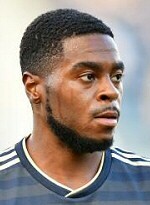 Epps was selected by New York in the MLS Waiver Draft in December after spending two seasons with the Philadelphia Union. "I'd like to officially welcome Marcus to the club," said Sporting Director Denis Hamlett. "We moved up to select Marcus in the waiver draft because we believe he is a talented player who fits our philosophy. We are glad to get this deal done at the start of preseason and look forward to getting him integrated into our squad." The Red Bulls traded up in the waiver draft to select Epps, who made 32 MLS appearances for the Union over two seasons, with three goals and three assists in 1,318 minutes. The 23-year-old played four years at the University of South Florida before being selected 25th overall by the Union in the 2017 MLS SuperDraft. "Marcus has a lot of qualities that we like," said Head Coach Chris Armas. "His ability and willingness to take players on and run behind as well as his attitude make him an exciting addition. We're glad to have him as part of our group."